For the fourth successive one-day international series between Ireland and Afghanistan, it all comes down to the last match after the hosts bounced back with a three-wicket victory at Stormont. A second successive half-century from Andrew Balbirnie and an undefeated 36 by Simi Singh saw Ireland to their victory target of 183, and their first home win for 13 matches since a Twenty20 success against Hong Kong in September 2016. Ireland won with more than six overs to spare but it was never that comfortable. Indeed, No.9 Tim Murtagh had a nervous wait while TV umpire Alan Neill gave his verdict on a stumping appeal with Ireland still needing eight to win, but he was given the go-ahead to continue and six balls later he hit the winning runs. Ireland also got another monkey off their back because Rashid Khan, the world's best slow bowler, took three wickets and, for the first time in eight ODIs, Ireland won the match. 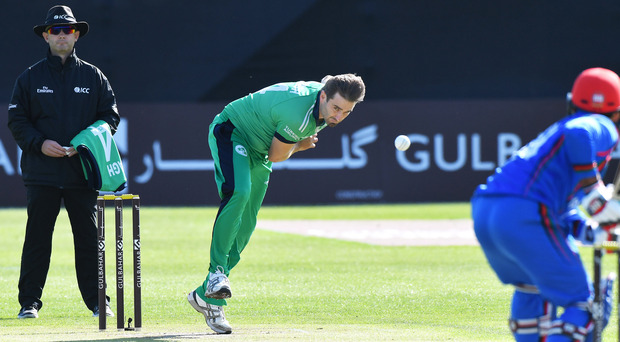 It was the Ireland bowlers who again set up the victory and, although there was no official man of the match, Murtagh must have been the leading contender having taken three wickets with the new ball, and when Balbirnie's direct hit from extra cover ran out Hashmatullah Shahidi, Afghanistan were 16-4. By the start of the 35th over they were 100-7 but, as so often happened in the five-match series in Greater Noida last year, Ireland could not finish them off and the Afghans batted out the overs to finish on 182-9. A tricky chase on a pitch which was never easy to score quickly - it was a different one from Monday - got that more difficult when skipper William Porterfield was bowled by mystery spinner Mujeeb Zadran's fourth ball without a run on the board, but Paul Stirling was quickly into his stride. The Middlesex batsman took any demons out of the pitch with two majestic cover drives off Aftab Alam, the first of which took him past 7,000 runs for Ireland, the third batsman to reach the landmark. Stirling also hit Mohammad Nabi for a straight six, but when he came down the pitch to the off spinner, he missed and was stumped. By then Balbirnie was into his stride and he brought up his 50 from 81 balls with only four boundaries but, needing less than four runs an over, it was the perfect occasion to knock the ball around and accumulate. Afghanistan knew they had to take 10 wickets to win the match, but as long as Rashid had overs in hand, Ireland were never comfortable. The second ball of his fourth over brought him his first wicket, Kevin O'Brien, the ball after a big edge for four through the slips, palpably leg before. His second wicket was the big one of Balbirnie, another edge and this time a sharp catch at slip, and just when Ireland thought they had seen him off, with the second ball of his last over, Andy McBrine was also adjudged lbw. But Singh would not be moved and, having already hit Mujeeb for six over long-off - only his second boundary - for the first time in his nine ODIs he saw his side to victory. Ireland went into the game with the same team that lost on Monday by 29 runs, while Afghanistan made two changes for their 100th international - Nabi has played in every one of them - with Mohammad Shahzad returning to his usual role as opener. But, just like Porterfield in the afternoon, Shahzad failed to survive the first over, indeed Murtagh trapped him leg before with his third ball - the second was a wide, the first Ireland had bowled in more than 50 overs after going through the first game without a bowling extra - the first time in 137 ODIs. With the first ball of his second over, Murtagh breached the defence of Hazratuallah Zazai - the left-hander who scored two lightning half-centuries in T20s but has so far failed to make an impression this week. When Murtagh made it three wickets in 13 balls, winning another leg before decision off Gulbadin Naib, Ireland were in the ascendancy. It could have been even better if Singh had not dropped a straightforward chance at mid-wicket off Rahmat Shah in Boyd Rankin's third over, and it was to cost another 28 runs as Shah, along with skipper Ashgar Afghan, led the recovery with a fifth-wicket partnership of 56. It used up 22 overs but it hauled the tourists back into the game. Singh, not introduced until the 27th over, broke the stand with his third ball, with the help of a smart stumping by Niall O'Brien, and when Nabi recklessly pulled Peter Chase to long leg, straight into the hands of Kevin O'Brien, it was looking so good for Ireland. On Monday, it was the home team who gave away two wickets to run-outs, this time it was Afghanistan, but credit to the Ireland fielding with Stirling's throw from short fine leg ending Afghan's rearguard innings - his 39 came off 82 balls with a solitary boundary. Despite being the seventh wicket, his side still added 81 from the last 15 overs, but it wasn't enough and the victory gives Ireland the chance to win their second successive ODI series in the same manner as the previous three-game series in Sharjah last December, from one down. • CIYMS will be presented with the Robinson Services Premier League trophy tonight if they beat Civil Service North in their 20-over rearrangement at Belmont (4.30pm). They lead Waringstown by 12 points with three games remaining, so victory tonight will secure the title.